This experiment introduces the use of digital multimeters for current measurement. Digital multimeters, or DMMs, perform a variety of functions. The DMM operates as an ammeter when measuring current in a circuit. More information relative to DMMs and their use in current measurement are provided in the links to the right. Current is a rate at which charge passes a particular point in a circuit. DMMs generally have two terminals, or leads. When the DMM is operating as an ammeter, these leads must be placed so that the current being measured passes through the DMM—the DMM displays this current. Therefore, when measuring a current, it is generally necessary to break your circuit apart at the appropriate point and insert the DMM leads between the two ends of the break. Disconnect the Analog Discovery or DMM Voltmeter connections. 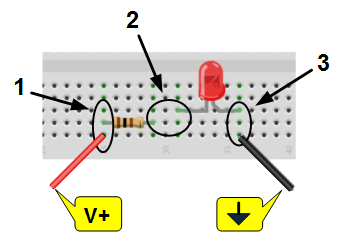 Break the connection between the resistor and diode and add the DMM ammeter connections (as shown in Part C of this exercise). Apply power to the circuit and read the current using the DMM. We want to measure the current, I, through the diode. Our sign convention is as shown; positive current is from the anode to the cathode of the diode. Break the circuit apart between the resistor and the LED. Connect A terminal of the DMM to the resistor terminal shown. Connect the COM terminal of the DMM to the diode's anode as shown. Make sure the resistor and LED anode are unconnected—they should be in holes in two different rows on the breadboard. 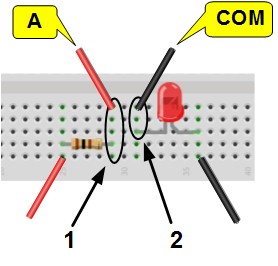 Connect the A terminal of the DMM to the resistor's cathode. Connect the COM terminal of the DMM to the diode's anode. Turn the function selection knob on the front of the DMM to the A position. The LED should light up and the DMM should display the current through the diode. Try reversing the direction on your current measurement (just interchange the A and COM terminals). This should just change the sign for the displayed number.